I seem to be stuck in this hand sewing mode so I will continue with it until I lose interest. I'm working in browns and purples now. This palette is not typical of me however I find it easier to breach my comfort zone when working on small pieces. I normally steer clear of batiks as they are not long arm quilting friendly. The weave of batik fabric is very tight, and the long arm needle sometimes bounces off as opposed to piercing through the fabric. This results in missed stitches and thread breaks. 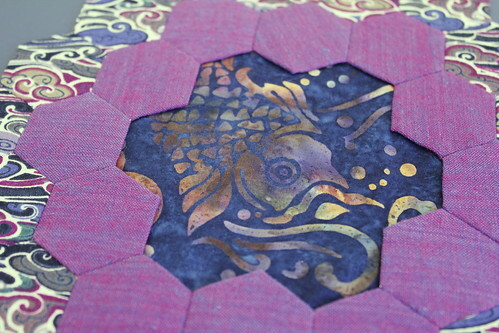 I couldn't resist this batik however, a purple, blue and gold cod that goes so well with Asian styled clouds on the outer ring of hexies. I'll just have to be extra careful when quilting this one. 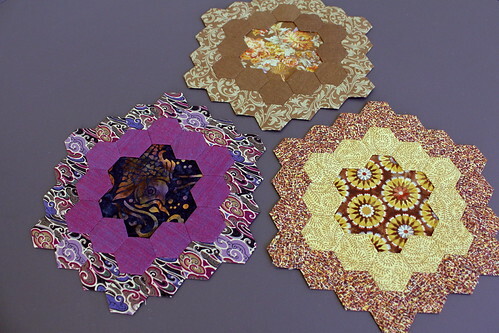 Onto more hexies! These are really beautiful! I really like the colors you chose, and your rings.